Take care of your teeth and you'll be all smiles! We get your whole mouth smiling! Dental health is more than just a nice smile. It’s comprehensive and preventive oral care. Good hygiene, routine cleanings and regular checkups are the foundations to your overall health. At Sluka Family Dental, we provide most preventive, restorative and cosmetic dental services for all of your dental needs. Looking to brighten your smile or improve the look of your teeth? Our practice is authorized for Zoom! Whitening and Invisalign. We also custom fit you with attractive, natural-looking veneers and dental implants. Call for a consultation. We accept many major Dental insurance plans. We are accepting new patients and families. 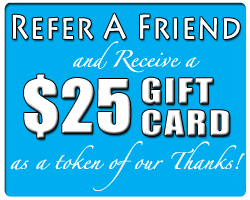 Refer a friend and receive a $25 Gift Card as a token of our thanks! Let Sluka Family Dental take care of your teeth. You’ll be all smiles! Follow us on Facebook for the latest happenings at our office! If you need a new family dentist in NJ, Sluka Family Dental is just what you’re looking for. Our professional staff is taking on new clients, and we would love to offer you and your family the highest quality dental care. We specialize in treating the whole family, from children who have just gotten their first teeth, to elderly family members, and everyone in between. Sluka Family Dental is the ideal choice if you’re looking for a cosmetic dentist in NJ, since we specialize in not only cosmetic dentistry, but in full dental care. Rather than visiting a cosmetic dentist for teeth whitening or veneers and following up with a different dentist for regular cleanings and dental health concerns, you can combine your two dental needs in one with Sluka Family Dental. Having your cosmetic dentistry procedures performed by your family doctor has several benefits. First, you don’t have to worry about finding a cosmetic dentist you can trust. If you work with Sluka Family Dental as your family dentist, you’ll already have a cosmetic dentist at your disposal if and when you want to improve the look of your teeth and smile. Second, your local dentist in NJ already has all of your health history and information. This means that any procedure you have done will be able to be done more quickly, and more safely. Your DDS in NJ should prioritize your whole dental health—not just the look of your smile. If the appearance of your teeth is your main concern, let us know, and we will create a dental strategy to improve the look of your teeth in the healthiest way possible. Our priority, even when doing cosmetic dental work, is the health and longevity of your teeth. We know that you only get one set of adult teeth, and it’s our job to help you make sure they last a lifetime. Cosmetic dentistry in NJ can improve your self-confidence and remove issues that might cause you to feel self-conscious about your smile. However, always remember that cosmetic work should never be performed if it means compromising the health of your teeth. If you want to feel more confident about your smile and improve the look of your teeth, tooth whitening can be one of the simplest and fastest ways to do so. One of the reasons many people avoid tooth whitening is because of the sensitivity it can cause to the teeth. Sluka Family Dental uses gentle yet affective tooth whitening methods that help you feel better about your teeth without compromising your ability to enjoy hot or cold foods. Dental care is closely related to the health and wellbeing of the rest of your body, which is why we focus on whole dental care. If you are looking for a new local dentist in NJ, Sluka Family Dental is the perfect choice for you. We look forward to meeting you and your family, and helping you achieve your goals in visiting your dentist, whether they’re cosmetic or related to the health of your teeth and overall wellbeing.